As we wrote here, the midterm election pointed out to some likely unexpected results. Those results finally materialized and provided interesting surprises. Undoubtedly, the best news was the electoral turnout, despite the threats of violence, boycott, abstention and rallies for “ballot annulling”. With 47% of the voters list showing up, it was the busiest midterm election since 1997. At State level, turnout surpassed an astonishing 60% in Nuevo León. Clearly, people opted for a democratic way to reject violence and provocation. The victories of the “independent” candidates, or more accurately “no party candidates”. The cases of Pedro Kumamoto (local representative in Jalisco), Manuel Clouthier (Congressman from Sinaloa), César Valdez (mayor in Nuevo León), Alfonso Martínez (mayor in Michoacán) and the rising star Jaime Rodriguez Calderón, a.k.a “Bronco”, elected governor of prosperous northern State of Nuevo León. The punishment vote and alternation. Five states switched from political colors, as voters punished serious corruption allegations against PAN governor Guillermo Padrés of Sonora and PRI´s governor Rodrigo Medina in Nuevo León. Or as a reaction to blatant abandonment as was the case of PRD in Guerrero and PRI in Michoacán. Finally but on a separate file, the enigmatic loss of PRI´s highly rated administration of Gov. José Calzada in central State of Queretaro, probably due more to an unconvincing campaign by the official candidate or to the decision of a more sophisticated electorate. Mexico City entering the multi-party system, as voters chose to end18 years of left wing PRD hegemony in the federal district. The party will retain 6 of 16 “delegaciones” (municipalities), while newcomer Morena wins 5, PRI gets 3 and PAN 2. In local Congress elections, Lopez Obrador´s new party Morena gives an outstanding performance wresting the majority of seats forcing down the PRD to second place and right wing PAN to third. Nationwide, Morena enters the stage as the fourth political force, displacing the green party PVEM. Surely a strong platform for Lopez Obrador´s 2018 presidential ambitions, but that could also prove insufficient to the task. The three major parties end up losing votes (PRD in a lesser proportion, by the way) but keep the 2012 ranking in Congress, conveying an implicit endorsement to the Pacto por México. As anticipated, PRI´s victory (along with its allies the Green Party PVEM and the Teachers´ Union Party PANAL) reversed the trend set by the three previous midterm elections where the ruling party lost majority in Congress. What they make of this victory will give abundant material for further discussion. * Lawyer and political analyst. Journalist in the newspaper El Economista and TV presenter in Canal del Congreso and AprendeTV in Mexico. As the votes from Sunday’s midterm elections were counted in Mexico, it was clear to everyone what the story of the campaigns would be. Jaime Rodríguez Calderón, better known as El Bronco (the rough one), is projected to be the clear winner in the Nuevo León gubernatorial election, more than doubling the vote received by each of his nearest rivals from the ruling Partido Revolucionario Institucional (PRI) and opposition Partido Acción Nacional (PAN) parties. The truly remarkable thing about Calderón’s candidacy is not his margin of victory, but that he ran and won as an independent — this was the first time in Mexican history that such candidacies were possible. His victory marks a potential sea change in Mexican politics, with voters increasingly tired of the established parties and disillusioned with the traditional political elites. The midterms were expected to change little at the national level, and at first glance that is what appears to have happened: the ruling PRI held on to its dominance of the federal congress, and there was only sporadic electoral violence in the states of Oaxaca and Guerrero. Yet, a number of key stories emerged on Election Day that hint at significant trends in Mexican democracy. First, the PRI only managed to hold onto its leading position by working closely with two other parties, the Verde (Green) and PANAL (a teachers’ union party). The PRI’s vote fell to around 29 percent, down from almost 32 percent support in the 2012 congressional elections. With the support of its allies, and the even more disappointing performance of the opposition PAN (21 percent) and PRD (10.6 percent), it will be able to maintain its majority in congress. Second, there was a high turnout, indicating that the Mexican public was indeed motivated to participate and that the parties were anxious to get as many supporters as possible to the polls. Third, the left is more divided than ever — the well-established PRD was almost matched in the polls by the breakaway Morena party, run by former PRD leader Andrés Manuel López Obrador. When the votes for the leftwing parties (PRD,Morena, Movimiento Ciudadana, PT) are added together, their total comes to almost the exact same number as the PRI’s. Fourth, there appears to have been a very high number of spoiled ballots (voto nulo) — almost five percent of the total number of votes cast. This points to a worrying trend towards electoral disenchantment, a tendency borne out by polling data on Mexican skepticism about democracy in recent years. But the story of the election is clearly El Bronco. The independent candidate for the governorship of Nuevo León, a wealthy northern border state and one of the country’s industrial engines. In his victory, Rodríguez broke the mold of Mexican elections by proving that success can come from outside of the established party system. As an independent, Rodríguez was one of fifty candidates nationwide running without party affiliation — in this, the first election in Mexican history where independents were allowed to run for office. The national and international media attention El Bronco attracted virtually guaranteed that even if he did not win the governorship, many more independent candidates would come forward in forthcoming elections, including the 2018 presidential contest. Mexicans’ growing disillusionment with traditional party politics and the established modes of democracy in their country may just see an outlet in the prospect of candidates who have broken free from the dominant party paradigm. LONE RANGER OR PROFESSIONAL POLITICIAN? “I’m not saying I am Superman, but I could be the Lone Ranger.” El Bronco used this phrase repeatedly during the race, and it served him well. Voters clearly identified with his outsider status, and he appears to have won 49 percent of the vote in Nuevo León, compared with 23 percent each for the PRI and PAN candidates. Of the 50 independents running in this election, only one other candidate won election, and this is no accident. Current electoral rules make it difficult for independents to compete with candidates from Mexico’s well-established political parties. Though independent candidates are allowed to have access to promotion on radio and television, candidates from political parties receive much more airtime. Campaign funding — which in Mexico has traditionally been entirely public — is more uneven still: independents receive less than one percent the amount the public funding received by their competitors from established political parties. Though independent candidates can receive private funding, the rules governing this have not been clearly delimited by the authorities. Nor is there clarity on the rules governing independents’ campaign spending. In El Bronco’s race, local authorities declared that the amount of private funds that a candidate can use cannot exceed 10 percent of total campaign expenses. In theory, these rules apply to candidates who receive public money through political parties. If they were applied to El Bronco, it would jeopardize his position because he received the equivalent of $23,000 in public financing — compared to the nearly $3 million that his competitors received just through their political parties. This legal uncertainty raises the prospect of postelectoral instability, challenges, and conflict. Despite these challenges, El Bronco led the polls in Nuevo León for the past three months, jumping nearly 16 points since March. He received a further boost when, a few weeks ago, Fernando Elizondo, a former interim governor and senator, dropped out of the race and threw his support behind Rodríguez. Rodríguez’s performance is partly a testament to his considerable political savvy and experience, and partly a reflection of his roots in local and sectoral politics. He is originally from Pablillo, a small town in central Nuevo León with fewer than one thousand inhabitants. As a young agricultural engineering student, Rodríguez fought against increases in public transportation fares and later became the leader of the National Agricultural Confederation in Nuevo León. For that post, he responded to an opponent’s complaints that he wore “exotic leather boots and jeans purchased in the United States” with a speech that rallied farmers to “stop thinking squat, and instead think big,” inviting them to dream of better boots, better tractors, and better incomes. These battles honed his campaign skills and furthered his image as a charismatic, nontraditional politico. In 2009, after climbing the political ladder to become a federal and local deputy, Rodríguez won election as mayor of García, a municipality with a population of around 145,000 that is part of the metropolitan area of Monterrey, Nuevo León’s capital. Here, he earned a reputation as a strong and determined character. His government philosophy is called the “García model,” and focuses on three policy areas: security, education, and labor. He considers the participation of government, citizens, and businesses to be fundamental to good governance. To facilitate this as mayor, he used unconventional methods — publishing his private telephone number so he could receive requests directly from the citizenry, or registering complaints and requests through his Facebook page. At that time, he realized that security was the number one concern of the electorate, so as a first step, he launched a strategy to take back some public spaces that had been claimed by criminals. More dramatically, he dismissed all of the municipal police in García. Those actions won him public trust, but also made him a target of organized crime groups, who kidnapped his two-year-old daughter, murdered one of his older sons, killed his city’s public security minister in the municipality, and tried twice to assassinate him. As insecurity and violence decreased in Nuevo León, his popularity transcended his term in office and the figure of El Bronco became known in the state and nationwide, with songs and even a film, Un Bronco Sin Miedo (A fearless Bronco), inspired by his story. In September 2014, Rodríguez decided to give up his membership to the PRI because he foresaw difficulties in obtaining the nomination to run for governor. In his resignation letter, he expressed the ideas that became the banners of his campaign for governor: political parties are no longer responsive to citizens’ demands, and the community is angry and tired of corrupt politicians. Relying heavily on Twitter, Instagram, Facebook, and YouTube as means to promote himself, he obtained registration as gubernatorial candidate. El Broncoran his campaign based on the strength of his personality and charisma. Through informal and often obscenity-laced speeches, he increased his popular support, promising to always speak the truth to citizens, and insisting that with courage and strategy, an effective and lasting security strategy can be built. Doubts remain as to the nature of the governor-elect. Is he truly independent, breaking away from the established model, or should we instead see him as a former party man who is first and foremost an opportunist and professional politician, someone who has seen the writing on the wall and is willing to do what it takes to win office? No matter what kind of governor El Bronco turns out to be, the rise of independent candidates should be read as a call for political parties to increase internal competition and improve the quality of their candidates. Parties clearly need to recapture the allegiance of the growing number of Mexicans who have lost faith in the established model. At the same time, civil society movements such as the 3de3 initiative (which calls on candidates to make a full disclosure of their business and financial interests) are raising public awareness about the issues of corruption and conflict of interest. Latinobarómetro polls consistently place Mexico at or near the bottom of the Latin American region in terms of citizen satisfaction with democracy. Whatever the more generalized implications of this for elections, El Bronco’s particular style of governing will be difficult to repeat at the gubernatorial level, and he will have to find new ways to face the challenges to come. Nonetheless, Jaime Rodríguez Calderón has bucked the status quo and emerged as the most compelling character of Mexico’s 2015 midterms. More intriguingly, as Luis Carlos Ugalde, former president of the electoral body in Mexico, recently said in an event at the Wilson Center, we cannot rule out the possibility that an independent candidate could run for president in 2018; while he or she will not likely have the strength to emerge victorious, they might win enough votes to tip the balance. The rise of El Bronco is emblematic of the rising disenchantment on the part of the Mexican electorate with the country’s political parties, and will likely prove to be a disruptive factor in national politics for years to come. Duncan Wood is the director of the Mexico Institute at the Wilson Center. Follow him on Twitter at @AztecDuncan. Pedro Valenzuela is a consultant with the Mexico Institute. * The political landscape in Mexico is now more fragmented than ever before with no single party towering over the others. Mexico has long been a political system based on three strong parties and a few smaller ones. Now there are at least five, if not more, that appear to have a significant base of support. The victory of an independent candidate in Nuevo Leon, Mexico’s most economically important state, sets a very important precedent that will decentralize the political system even more in the future and allow citizens to organize outside the traditional parties. * It was a mixed night for President Enrique Pena Nieto and the PRI. Although the PRI appears to have won the largest number of votes for Congress and state governors, the party won less than 30 percent of the vote, appears to have lost a few crucial governors’ races that it had expected to win (Nuevo Leon, Queretaro, and Michoacan), and will have to piece together a working majority in the Congress with the Green Party, the New Alliance Party, and perhaps a few others on key votes. Of course, it’s not unusual for the incumbent party to lose ground in the midterm elections (this is the fourth straight time it’s happened), but the PRI seemed to be in a particularly strong position going into this election and expected to do much better. This election is hardly a repudiation of Pena Nieto’s government — which will likely be able to move forward with its reform agenda in Congress — but it’s certainly not a ringing endorsement either. * The PAN came in as the second strongest party, though it received only a fifth of the votes, and the left divided like never before among various parties. Andres Manuel Lopez Obrador’s party, Morena, made a very respectable showing against the PRD, probably winning five of Mexico City’s delegations (municipalities) and presenting a strong challenge to the PRD in the bastion of the left. * The elections were actually carried out in relative peace, despite attempts to disrupt them in three states in the south. However, an unusually high number of voters (roughly five percent) appear to have left their ballots blank in protest against all of the political parties. In the next few hours, we will know more about how the main parties ended up and who will govern each state, but clearly this is an election that has shaken the foundations of Mexico’s political system like few others. Andrew Selee is the Executive Vice President of the Wilson Center and Senior Advisor to the Mexico Institute. Mexico City is home to more than 9 million people. However, the daily metropolitan area movements reach 29 million people. In addition to this, the city is the seat to the three branches, as well as very prominent private companies. Therefore, population density and political resonance are some conditions that make Mexico City politically attractive. In fact, governing the city can boost political aspirations of the mayors. This has occurred since 1997, when the inhabitants of Mexico City had the opportunity for the first time to choose their authorities – before this, both the delegation chiefs (figure similar to the municipalities) and the Mayor were elected by the President. This was true with Cuauhtémoc Cárdenas, the first Mayor of Mexico City and former presidential candidate in 2000 for the third time; with Andrés Manuel López Obrador, former presidential candidate in 2006 and in 2012; and with Marcelo Ebrard, who ran to be the presidential candidate in 2012, but lost against López Obrador in the primary elections. While the contemporary history of Mexico City should be told predominantly from the left, as it has been the bastion of these political forces for 18 years, the fragmentation of the left parties and the growing competition from traditional parties, such as the PRI and the PAN, make this 2015 election crucial to determine the political future of the capital. Here, we present an analysis of the conditions at play and some of its most important players. While previous mayors, like the current mayor Miguel Mancera, were chosen by alliances led by the PRD, the story today is very different. Cuauhtémoc Cárdenas, the historic leader of the party, resigned his membership this year. Andrés Manuel López Obrador is currently the main leader of the new party MORENA, which encompasses, among other characters, former close aides who worked with him during his term in Mexico City’s office. Marcelo Ebrard sought a place as Federal Deputy in these elections but by Citizens’ Movement (MC), a previously close ally of the PRD. In fact, electoral authorities determined his ineligibility for quitting the PRD just before enrolling in the other party. Thus, the division of the left becomes more evident in Mexico City leadership. The bottom line is that the competition between the PRD and MORENA will potentially be close in some areas of the city. Most of the PRD candidates have been chosen from local leaderships and closeness to Miguel Mancera’s administration and PRD national leadership. On the other hand, MORENA candidates are basically national-level figures, such as former state governors and people close to the López Obrador political group. Thus, although the PRD currently governs 14 of the 16 delegations (see map), it is expected to have strong competition in very important places such as Iztapalapa and Cuauhtémoc. Historically, the PAN and the PRI have had little presence in Mexico City. The PAN currently rules the Benito Juárez delegation, which has been its political bastion in the city for the last several years, and the PRI rules the Cuajimalpa delegation. In the case of the PAN, some important figures are also competing for delegations such as Miguel Hidalgo, and the party aspires to govern more delegations as they did in the midterm elections of 2009 (see map). For its part, the PRI Cuajimalpa aspires to preserve and perhaps strengthen its presence in other areas of the capital. Just a couple of weeks ago, Cuajimalpa recorded a violent confrontation between supporters of the PRI and PRD, which ended with a non-aggression pact between state party leaders. In summary, these 2015 elections for Mexico City will measure the strength of different leaderships and parties on the left that will lay out the competition towards the 2018 Presidential Election. At the same time, electoral competition between the PRD and MORENA will be close in some areas of the capital.This is especially important as this is the first election for the latter party. Finally, this increasing competition and its immediate consequence of split voting could help the PRI and the PAN to gain positions. Finally, this electoral battle in Mexico City comes at a crucial time when Congress is discussing the creation of a new Constituent Congress to give Mexico City a constitution and character as a federal entity, which would affect the checks and balances that the city has historically had (see our latest Op-Ed on the topic). Visit here for more information on this election. Visit here for information regarding political parties in Mexico. Rule of law and security. The PRI, PAN, and PRD agree on increasing anti-corruption controls at the state and municipal levels and on raising penalties on public servants. They also agree on increasing education on and emphasis on human rights, both for citizens and security personnel such as police, Legislative Proposals from the PAN, PRI, and PRDjudges, and military. The PRD proposal focuses on drug decriminalization; the PAN seeks to promote the creation of public agencies to monitor compliance with the new anti-corruption rules; whereas the PRI focuses on the implementation of some of the security measures announced by the President in recent months, such as a single police entity at the state-level and a single nationwide emergency number. Economy and public finances. The PRI, PAN, and PRD agree on raising the minimum wage but differ on the level and method of doing so. The PRI encourages the use of public spending to boost development in specific industries and regions; the PAN wants to ensure multi-year investments in infrastructure projects; and, the PRD and PRI are proposing the establishment of unemployment insurance. Energy and sustainability. The PRI and the PAN agree to monitor the implementation of the reform to increase certainty for international investors, increasing transparency and accountability at every stage of contracts. The PRI is looking for policies to increase production of crude oil and the PAN seeks to focus on renewable energies. The PRD, in addition to seeking to repeal the energy reform, focuses on lowering prices to final consumers in gasoline, diesel and electricity prices. Despite the apparent point in common that the parties have, it remains to be seen if the political incentives may provide an environment to reach productive agreements given the fact that this legislature will be a prelude to the next presidential succession. At the same time, it remains to be seen if the President and his team revive the political ability shown in the start of his government in order to build consensus with the opposition parties in key areas. Finally, returning to the discussion of proposals, while it is not clear that Mexican society is enthusiastic about these elections, it is a good sign that the INE, UNAM, and other organizations are focused on disseminating information among the electorate and promoting the debate on the proposals. Hopefully, it will help to overcome apathy and increase voter turnout next June. 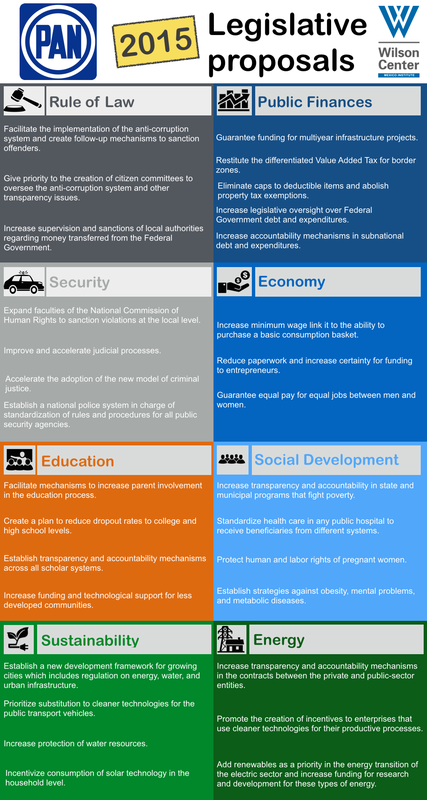 See the infographics below analyzing key issues on the PRI, PAN, and PRD legislative proposals. 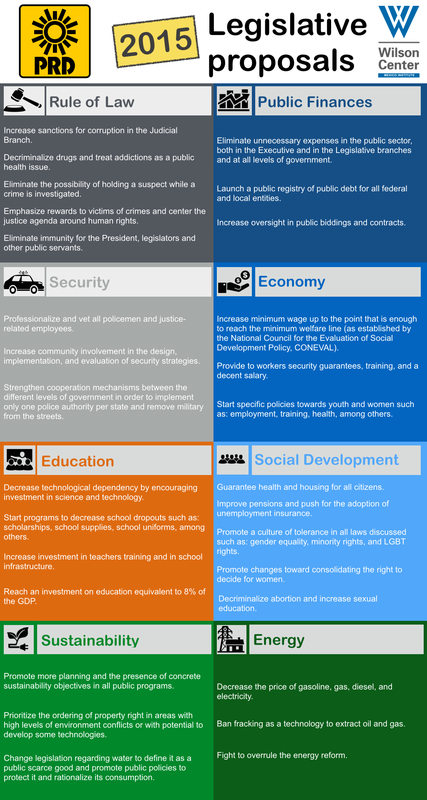 The proposals are grouped into 8 categories: rule of law, public finances, security, economy, education, social development, sustainability, and energy. In this infographic, the Mexico Institute analyzes the published polls of some Mexican states holding gubernatorial elections in 2015. We highlight the top two candidates in the states, except in the case of Nuevo León, where we want to highlight the surprising rise of an independent candidate above the PAN’s candidate (click here to read our previous analysis on Nuevo León). In general, the fight for governor in each state will end up being between two candidates or coalitions. The PAN is competitive in almost all of the gubernatorial races, but the PRD is strong in the southern region of the country. Furthermore, the PRI is competitive in all of the elections, either leading the preferences or coming in a close second. In particular, in the states of Sonora, San Luis Potosí, Querétaro, and Michoacán, the race will likely become more competitive as the campaigns continue. In the states of Colima, Guerrero, and Nuevo León, although the current leaders have a significant advantage, this may change due to the recent trend of the other top contenders. Finally, in Baja California Sur and Campeche, the leaders in the polls could strengthen their positions as the campaigns advance. Mexico’s political elite has been roiled in recent months by a succession of corruption and conflict of interest scandals. The “Casa Blanca” scandal involving the First Lady, Angélica Rivera, followed closely by similar incidents involving the Finance Minister, the President himself, one of his closest advisors, and most recently the head of the CONAGUA (the national water commission), have all raised public awareness and criticism of the prevalence of graft within the Mexican political system. It is not only the government that has been affected, as both the PAN and PRD opposition parties have been tainted by scandals of their own. What’s more, the divided nature of the opposition parties has hindered their power to take advantage of the recent crisis of legitimacy faced by the government. However, in the eyes of the electorate, corruption has emerged as a key topic in the electoral campaigns. Social media in Mexico has been awash with the issue, and a group of think tanks and NGOs, including IMCO and Transparencia Mexicana, have launched a collaborative effort calling on Mexican politicians to make a full declaration of their income, holdings, and interests. Thus far, only 19 candidates to congresses and municipalities have complied and only 3 candidates to governorships. Beyond the headlines, however, it is important to remember where the debate is currently and what the parties are proposing in their electoral platforms. Last February, the Chamber of Deputies approved constitutional amendments to create the National Anticorruption System. Some notable changes are: 1) Senate ratification for the Secretary of Public Administration, 2) expand the abilities of the Superior Audit Office (ASF) to monitor expenditures in real time in contrast with lag-monitoring, 3) increase sanctions for public servants accused of corruption acts and include sanctions for private entities involved in those corruption acts, 4) direct appointment of the Chamber of Deputies of the internal control offices for autonomous bodies, among others. In March, the Senate began the analysis and debate on the amendments submitted by the Deputies. Last week, Senate leaders met to determine the legislative objectives towards the end of the regular period and among them is the final approval of these constitutional changes, a situation that will likely happen in the next few weeks with the recent approval of the freedom-of-information law. However, with only just over two weeks left for the current legislative period in Congress, there are some issues that the next Chamber of Deputies (which will begin in September) will likely be in charge of debating and approving. The Center for Social Studies and Public Opinion of the Chamber of Deputies recently conducted a survey on the National Anticorruption System, which showed that 85% of citizens believe there is a big problem of corruption in the country, contrasting with only 7% indicating that there is a strong sense of justice in Mexico; in fact, 57% believe that corruption has increased in the last 12 months. Only 45% know or have heard of the National Anticorruption System, but 73% indicate that the country needs legislation on that matter. Finally, of the measures in the new law, the following methods to punish acts of corruption were ranked the highest: 1) punish acts of corruption both for public servants and for private entities, 2) the creation of a National Committee, including civil society, to follow up on corruption issues, 3) expand the powers of the Superior Audit Office, and 4) prosecute and punish acts of corruption, even if no formal complaint is filed. The party is proposing further actions to consolidate the current law being debated in the Senate. Specifically, the PAN proposes the creation of citizen observatories to follow up on corruption and accountability issues and expand the powers of local comptrollers in order to fight corruption in the local-levels. In addition, the party proposes strengthening the role of municipalities to meet public safety needs and establish coordination schemes with state and federal authorities, and also to expand the powers of the ASF to oversee federal contributions to states and avoid debt growth. The party aims to strengthen the powers of the ASF in the monitoring and control of public spending and strengthen the powers of the Federal Institute of Access to Information and Data Protection (IFAI in Spanish) in order to accelerate decisions regarding access to information. 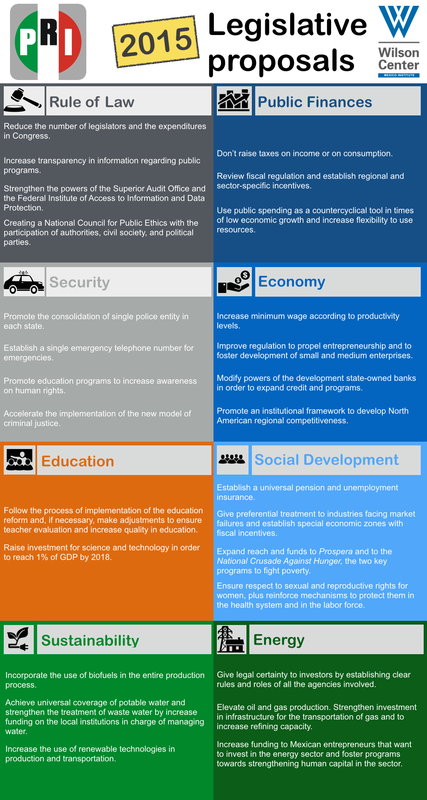 In addition, it proposes creating a National Council for Public Ethics with the participation of authorities, civil society, and political parties. The party proposes to create a High Court to prevent, audit, and punish public servants, citizens, and political parties who engage in acts of corruption. This institution will have the ability to audit ongoing processes and will be autonomous. It also aims to regulate bidding and concessions processes, the use of public resources (including monitoring of public debt), promote accountability mechanisms, create an austerity bill, and reduce unnecessary and burdensome costs. In conclusion, corruption is not only at the center of the allegations and the struggle for the vote of Mexicans, it also occupies an important place in the platforms of political parties. There are clearly issues in which there are significant similarities in the proposals, such as increasing monitoring on public expenditures at the local level. At the same time, there are others which potentially could lead to finding middle ground, such as citizen oversight in anti-corruption mechanisms or local institutions to sanction acts of corruption. With all of these, the new cohort of deputies will have to engage in negotiations and debates in order to give the country a credible and effective system to combat corruption. Serious doubts remain, however, about the commitment of both politicians and parties to reforming the system and aggressively attacking the corruption problem in Mexico. According to Mexican experts, graft is so deeply embedded and so widespread that there is not a party that can be considered immune from accusation, and even with the passing of new laws, the acid tests of implementation and compliance will prove to be a major challenge for policy makers that will require a vigilant eye from civil society. This article was also published in the Mexico Institute website. This year, the Mexico Institute is working on proposals and analyses regarding transparency and rule of law. You can visit our infographics regarding this topic here and other important publications here. Here you can find all the electoral platforms, as registered to the INE (in Spanish).